Our service features all-natural solutions safe for your family, your carpet, your home and the environment. Our products are green-certified and FDA-approved! Your carpet cleaning service from Welch’s Chem-Dry starts with a consultation from our technician. He will explain our process and answer all of your questions before he begins the service. Then the technician vacuums every square inch of your carpet. This includes in corners, along baseboards and beneath furniture. Deep vacuuming is one of the best things you can do for your carpet. Our service wouldn’t be complete without it! Welch’s Chem-Dry then lightly sprays The Natural® cleaning solution over your carpet. One light mist is enough to permeate into the carpet fibers and lift deep, embedded dirt to the surface. The Natural® consists of a mixture of H20 and carbonation that creates millions of bubbles powerful enough to lift soils and germs. There are no soap or chemicals in The Narural® whatsoever. Now we will employ our Hot Carbonating Extraction (HCE) cleaning method that uses heated suction to extract the particles, dirt, allergen and cleaning solution from the carpet and dispose of it outside of your home. HCE is carpet manufacturer approved and one of the safest and most effecting carpet cleaning methods available. No residue is left behind and it delivers a deeper, lasting clean that’s healthier too! After HCE is complete, Welch’s Chem-Dry cleans up all traces of our solutions and equipment, loads up our equipment and answers any additional questions you might have after the service. Because our carpet cleaning requires 80% less water than steam cleaning, your carpet should be dry in just a few short hours after we leave. You will be delighted with your service from Welch’s Chem-Dry and, of course, the results too! However, if for some reason, you aren’t 100% satisfied, please let us know. Our customer’s happiness is our first priority. Call (334) 286-9271 so we can help. We offer our carpet cleaning service to local businesses too! Don’t trust your carpet cleaning to a janitorial service or rental machines. Trust professionals. Welch’s Chem-Dry has over 20 years of experience cleaning carpet for large and small businesses in Montgomery, AL and surrounding communities. Learn more about commercial carpet cleaning from Chem-Dry of San Angelo. We’re Flexible! Our service is available before or after business hours so as to not interfere with your employees or customers. Plus, carpet dries fast too! So not wet floors the following business day. Professional cleaning for upholstery and fabrics to restore the beauty of your home’s furniture. Welch’s Chem-Dry technicians provide expert care for your area rugs, rug runners and fine textiles. Deep cleaning for tile and stone floors and grout to reach embedded bacteria, particles and soil. P.U.R.T.® from Chem-Dry delivers safe and successful removal of harmful pet urine odors from carpet. Try our FREE ESTIMATE online form for pricing. Welch’s Chem-Dry represents Chem-Dry throughout Montgomery, AL. Our customers receive the finest products and service in the industry with support from Chem-Dry and our own commitment to quality and excellence. We have been in business for over 20 years due to that commitment and are proud to combine the trust of a national franchise with the customer attention and focus of a small, family-run business. Our technicians receive continued education and constant experience in proper cleaning techniques and stain and dirt removal. Each technician goes through a rigorous 5-star certification process to ensure our customers receive only the finest expert care. 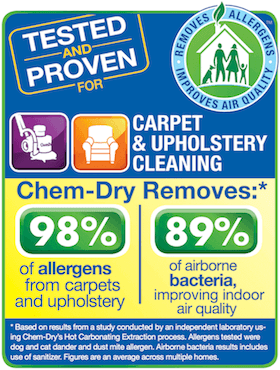 Welch’s Chem-Dry provides superior carpet and upholstery cleaning! Carpets dry faster than with other carpet cleaners. I have been using Welch’s for 10 years and have always been pleased with the results. David Welch and his son are always prompt, courteous and professional. The next time you need your carpet cleaned give Chem-Dry a call. – Margaret H.
Welch’s Chem-Dry did an amazing job on the carpet in my home! David was very nice and extremely accommodating to my schedule. He arrived on time. David thoroughly explained the process he was using to clean and sanitize my carpet. I will be using them from now on! – Terri D.
Welch’s Chem-Dry did a great job cleaning the carpet in our home. I was very shocked when David was willing to fit me in on the same day. He really cares about his customers. He took the time to educate me on the importance of carpet cleaning and the products his company uses. His equipment even removed pet dander! – Amber W.
We’re on Facebook: Posts feature information on our services, local news, recipes, pet care tips and a little fun too! Let us know how your appointment went. We love to hear from our customers. Share a review here. The City of Montgomery is located in Montgomery County, Alabama and is a new but old fashion city. It is the perfect combination of Southern charm and modernity. The cosmopolitan downtown and the lively riverfront draw in fun seekers from all around. The long-standing blues and jazz clubs of Montgomery, as well as, the local museums display the city’s contribution to music, history and literature. We are home to a number of great higher education facilities like Alabama State University, Troy University and Auburn University at Montgomery. There are also some private colleges in the area like Faulkner University, Amridge University, Virginia College, and Huntingdon College. The Maxwell Air Force Base is located in Montgomery and brings military members and their families to the area. It is home to more than 12,500 personnel, ranging from active duty military to civilian and contractors. The downtown area of Montgomery is full of hip restaurants, hotels, and music halls. The Montgomery Performing Arts Centre delights audiences with rock concerts, Broadway musicals and ballet performances. Montgomery is known for its blues and jazz clubs like Sous La Terre Downtown Underground on Commerce Street. The city also offers free musical events like the outdoor moonlight concerts by the Montgomery Symphony Orchestra. The Montgomery Riverfront Park is located to the northeast of downtown along the Alabama River. It is of Montgomery’s main attractions for visitors and residents alike. They hold concerts, plays and movies. The downtown area is also home to the Montgomery Riverwalk Stadium, which is a high-tech baseball field built around a restored train station. They host the Montgomery Biscuits team. Also, located here, the Harriot II Riverboat, cruises the river with live music, food and dancing. The Scott and Zelda Fitzgerald Museum is the home that the author of “The Great Gatsby” and his wife, who was also a writer, along with their daughter lived in from 1932 to 1932. The Hank Williams Museum features the life story of the famous, Hank Williams who was a legendary country singer and songwriter and is buried in the Montgomery’s Oakwood Cemetery. Montgomery is commonly known for its involvement in the civil rights movement. Rosa Parks notably lead the Montgomery Bus Boycott in 1955. There is a Civil Rights Memorial and Center that honor the 40 Americans who died during the fights for equality. Montgomery is known for its good Southern comfort foods. Local restaurants menus include fresh seafood from the Gulf Coast and local favorites like grits, collard greens and sweet tea. Martin’s Restaurant on Carter Hill Road offers the “choose one home-cooked meat” like fried chicken or catfish, and your choice of three other delicious sides. Charles Anthony’s Restaurant at the Pub offers fine dining with choices like Gulf shrimp and steak. The Montgomery Zoo is a great outdoor attracts. There are more than 500 animals and 40-acres to explore. The barrier-free exhibits that make the visitors feel like they are a part of the environment and are more comfortable for the animals. Montgomery is a beautiful city with tons of old-fashion southern charm and all the comforts of modern times. We are proud to live and serve in Montgomery. Welch's Chem-Dry Copyright © 2019.